The 5th annual exhibit of this art show and sale will be held at The Stable at Bluemont Vineyard just outside the charming 19th Century village of Bluemont. The Stable, a beautifully renovated building set on the slopes above Great Country Farms, boasts a spectacular view of Loudoun Valley and is a wonderful venue for both artists and visitors. Bluemont Vineyard’s tasting room sits just above The Stable so visitors can combine viewing local artists’ work with wine tasting. Great Country Farms offers many attractions for the entire family, and visitors can walk the unique village of Bluemont and stop in the recently restored Bluemont General Store and visit Black Shutter Antiques . All proceeds of the show will benefit Friends of Bluemont, a non-profit preservation organization. 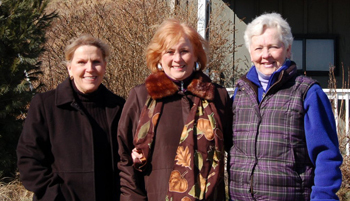 Pictured: Organizers Betty Potter, Jean Hutcherson, and Pam Forbes.